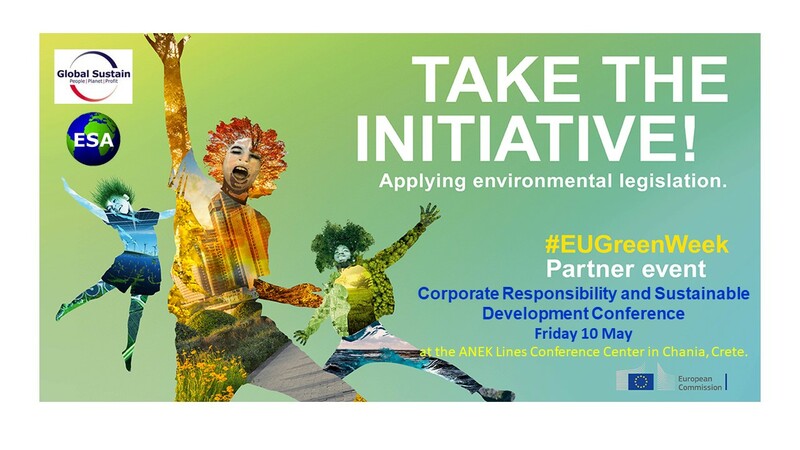 The event launches ESA's full EUGreenWeek programme and aims to inform a wide range of people about practical environmental actions in Corporate Responsibility and Sustainable Development with a focus on the agri-food, tourism, transport and energy sectors. GLOBAL SUSTAIN, Sustainability Forum Tour 2018, Crete 6th – 7th October. EUGREENWEEK 2018 partner event ‘Bamboo Bike Ride Crete’ was a success “more than we could imagine”. See here for yourself. 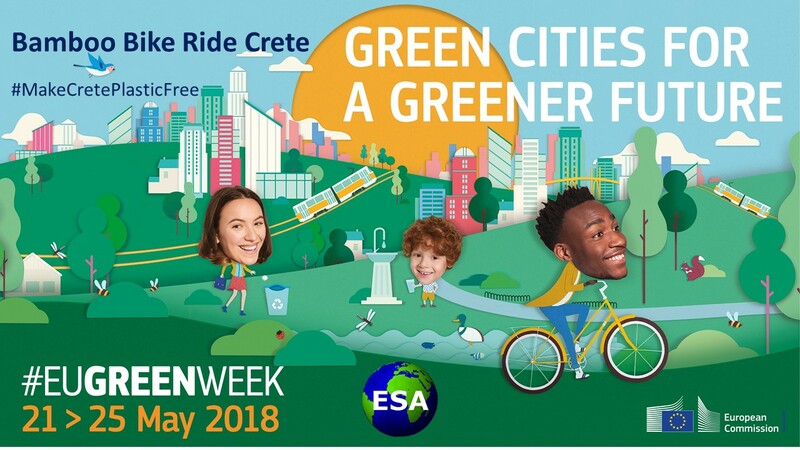 May 21 - 25 ‘Bamboo Bike Ride Crete' was a ESA, official EUGREENWEEK partner event organised by Sharon Jackson to promote ESA's #MakeCretePlasticFree campaign. 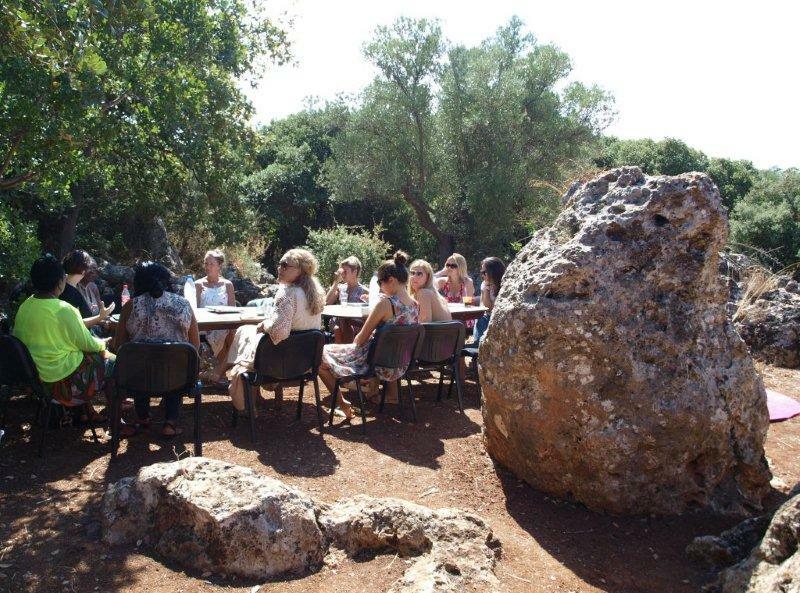 The event was designed to involve diverse stakeholders from local government, eco- activist groups, young entrepreneurs club, the general public and to collaborate with organisations interested in creating greener living and working practices in Crete. 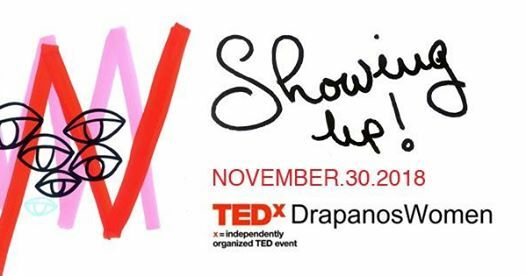 The full 5 day event consisted of open seminars, a 4 day bamboo bike ride from Rethymnon to Falasarna and a 'Trash Art' exhibition organised by Chloe Dimitriades at Biolea. The brilliant core team of ‘bamboo bike riders' consisted of Thomas Mönch and Sharon Mechta of Biotic Bikes and Spyros Petrakis of ΔΕΔΙΣΑ ΧΑΝΙΑ with guest rides by Suzanna Scott of Charma Beer-Cretan Beer, Anargyros Koutroumpas of Cleopatra's Sponges. The start was hosted in Rethymnon by Vice Mayor Pepi Biriiraki and Rethymno Tourism, thereafter local businesses The Olive Grove - Armenoi, Piperia-Klaives Salis - Chania and Fisika in Tavronites hosted the exhibition and rest stops along the route to give a wide range of people the chance to see the bamboo bikes and engage 'hearts and minds' about reducing single use plastic in Crete. For back up support, Mr, Stelios Mylonakis from Strata Tours provided transfer services.. The event created 480 impacts with diverse people including more than 100 school children who care about reducing plastic waste in the ocean. Not surprisingly Bamboo Bike Ride Crete attracted media interest with 3 TV broadcasts and 5 news articles in Crete and Athens. ESA is already planning BBRC 2019. 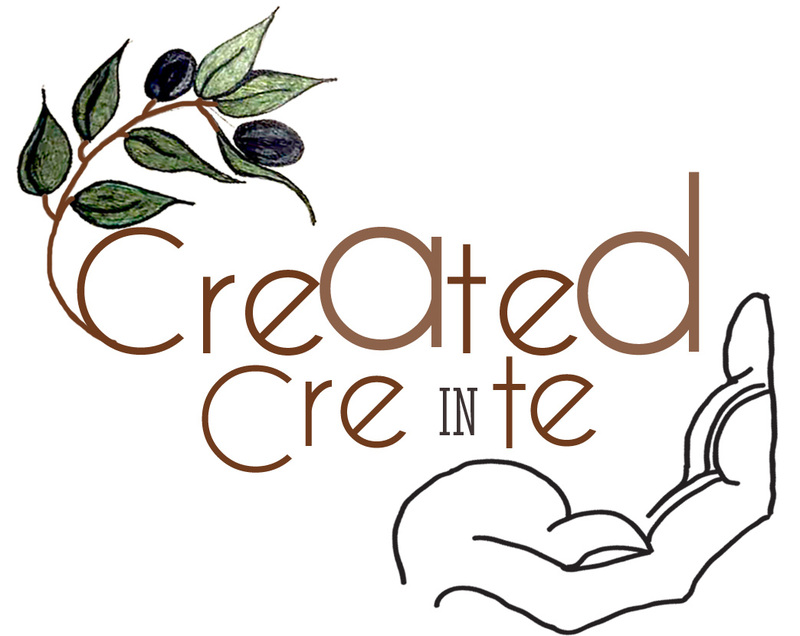 Bamboo Bicycle Ride Crete, a video summary of each day. 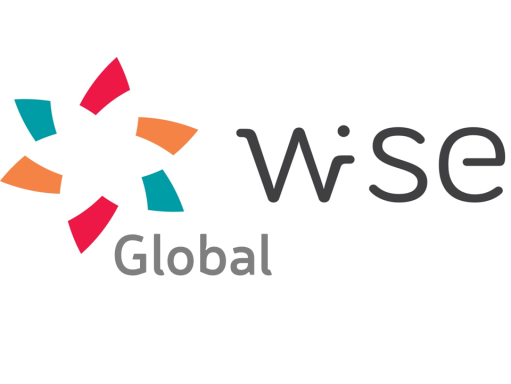 Women Innovators in Sustainable Enterprise (WISE) just went GLOBAL! Between 17th and 25th May 2018, as part of EU Green Week, Green Cities for a Greener Future, in collaboration with the Bamboo Bicycle Club in London, ESA is hosting a fun, educational event and the FIRST EVER bamboo bike ride East to West of Crete. Riding over 302km, between Sitia to Kissamos, to encourage people to be part of creating change and #MakeCretePlasticFree #EUGreenWeek. 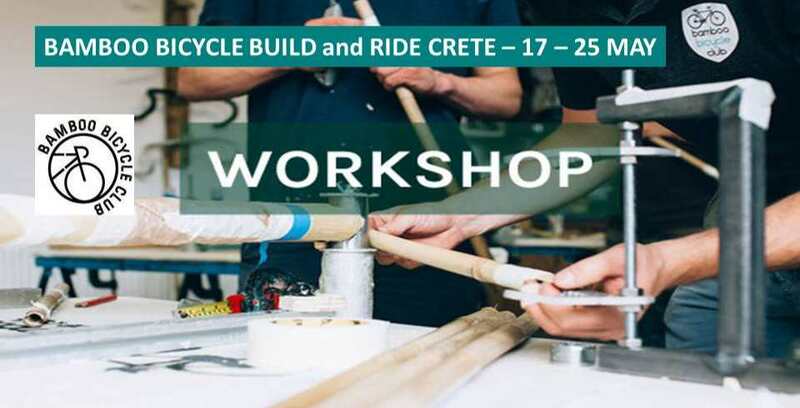 We are looking for Bamboo Bike Builders, Bamboo Bike Riders and Event Organisers to be part of the 'build and ride' team to build 4 BAMBOO BIKES at the beautiful ESA, off- grid, natural materials eco-building, in the Natura 2000 location of Drapanos, Apokoronas. Would you like to sponsor a unique, one off, made to your specifications, personalised branded 'Made in Crete' Bamboo bike? These Bamboo Bicycle bikes are NOT FOR SALE! You have to build them and enjoy the lasting pleasure of design and creation. 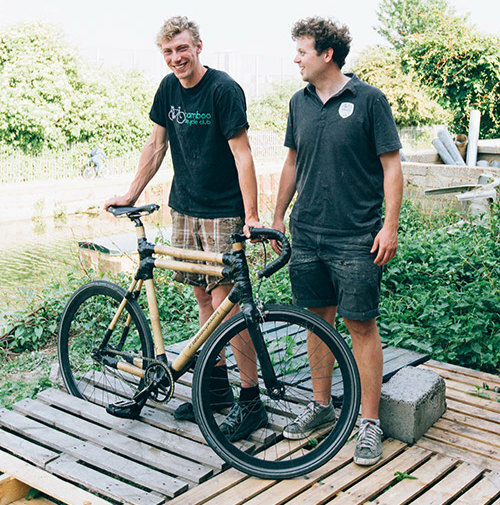 James and Ian, co-founders of Bamboo Bicycle Club: Bike riding engineers, who after their own enthusiastic experiments in building bamboo bikes, decided to create a bicycling community with others who are interested in building their own beautiful, robust and environmentally friendlier bamboo bicycle frames.